Menschen, die aus den verschiedensten Ländern nach Österreich gekommen sind, übersetzen einen kurzen Text. Ähnlich dem Spiel Stille Post reist dieser Text von TeilnehmerIn zu TeilnehmerIn. Dabei verändert er sich und wird individuell geprägt. 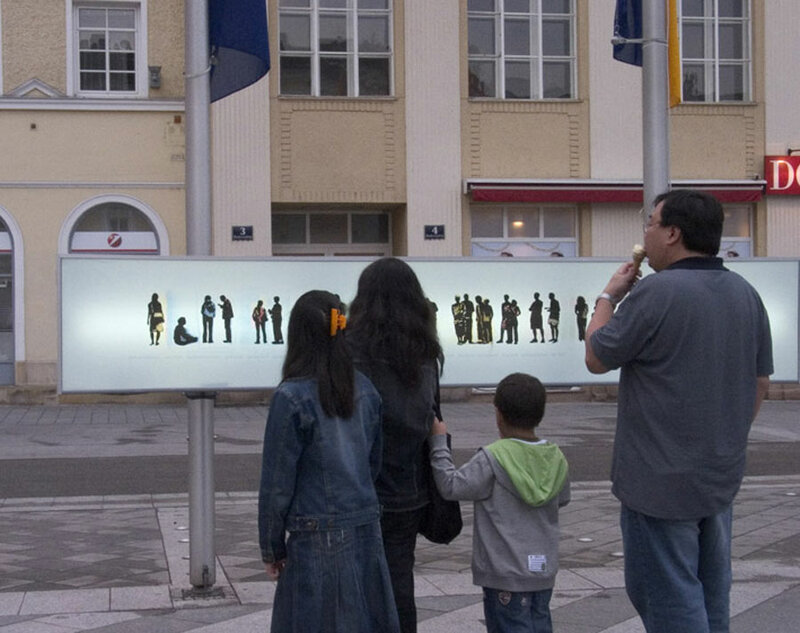 People who have come to Austria from the most diverse countries translate a short text. Similar to the game "Chinese Whispers", the text travels from one participant to the next. It changes along the way and is influenced individually. Dieser Text wurde nach dem Prinzip des Kinderspiels Stille Post übersetzt und weitergegeben. 22 Personen mit migrantischem Hintergrund, die in Österreich leben, gaben dem Text ihre eigene Prägung. Das Ergebnis ist ein Kunstobjekt für den öffentlichen Raum, das sowohl visuell als auch akustisch präsent ist. ung innerhalb einer Region wird in der alltäglichen Wahrnehmung jedoch kaum Rechnung getragen. Uns interessiert Migration als Faktor einer gesellschaftlichen Weiterentwicklung. This text was translated and passed on using the principle of Chinese whispers. 22 people who presently live in Austria and who have a migrant background imparted their own spin to the text. 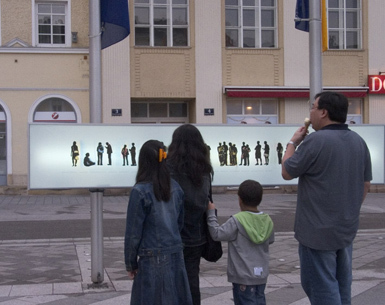 The result is an art object for public spaces, one which is present both acoustically and visually. The changes in the text are an opportunity to take a look at the relativity of oral systems of communication. Whoever travels in a foreign country is forced to extract from a minimum of information the maximum possibilities for action. Many migrants accomplish this balancing act between worlds every day often with multipe languages. The heterogeneity and multilingualism of the people in a region is almost never taken into account in our daily perceptions. We are only interested in migration as a factor in further socio-economic development. Abdullah Aarguusi, Razije Baumgartner, Christiane Beinl, Fatou Diagne, Laila Fardelahi, Faride Hamidpurpanami, Adin Hamciz, Erdoan Mehmedi, Bilgic Mesud, "Pasqual", Yichun Liao Riedling, Sulieva Suchra, "Vilar", Caliskan Ziya, Milaim Zyrapi.